While some MS patients turn to modern medicine for treatment, Pat Wagner uses Bee Venom Therapy to decrease her chances of a relapse. Wagner, an MS patient since 1970, began BVT in 1992 after she experienced an exacerbation that was resistant to medication. Before beginning therapy, Wagner was not on any frequent medication. Wagner said she began intentionally stinging herself approximately 100 times daily. She then came to the realization that decreased the number of stings she administered. “The number of stings is not better; it depends on where you sting,” Wagner said. Wagner stings herself in specific places on her body, depending on what her symptoms are that day. Wagner has three hives that are kept at her home in Waldorf, Md. She has two in her backyard, containing 40,000 – 50,000 bees, and one in her kitchen, containing 10,000 bees. She said the upkeep is fairly easy, considering the bees fend for themselves. She often has visitors stop by her home asking for bees for therapy. Wagner said there is no negative side affects from BVT, and her symptoms have become less frequent since she began the treatment. She truly believes in what some might call a “holistic” treatment, and frequently considers her bees when thinking about the wellness of others. “All I can tell you is to Bee Well,” Wagner said. For more information about Pat and BVT, visit http://www.olg.com/beelady/default.htm. In an interview with an individual, Diane R., living with MS, she revealed her daily trials and tribulations. 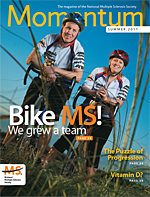 Q: How long have you had MS, and what kind do you have? A: I was diagnosed in 2005, and I have relapsing-remitting. Q: What happens to you in a relapse? A: I experience weakness from the heat. My body generates spasms, numbing, tingling and double vision. I become unbalanced. I also cannot wear closed-toe shoes because of the heat. I have 33 lesions on my brain, but I still have RRMS, which is the least progressive. I try not to pay attention to how many lesions I have, but to where they are located on my brain. I am positive when it comes to my illness because I can still walk. Q: What is the best approach to handling your illness emotionally and physically? A: As for emotionally, I use prayer for support and to deplete my stress level. I try to remove myself from stressful situations. On a physical aspect, I’ve had to learn not to do things that will overheat my body. I’ve also learned to do things in stages and to take breaks when I become tired. Q: What would you like to tell me that would impact my readers? A: The most important thing is your faith. When I was in a wheelchair because my symptoms were so bad that I couldn’t walk, I prayed the hardest that I ever have before. God put me through it, and I believe that is why I am not in a wheelchair today. Q: What kind of treatment are you on? A: I am currently on Copaxone, and I luckily do not have side effects. I sometimes have a little itchiness in the injection site area. Q: What are your doctors saying about any kind of progression of MS? A: They are unable to determine any kind of progression because the disease is so complicated and unknown. 1. Treatment: It is important for all MS patients to seek appropriate treatment in order to prevent relapses. I am currently on Rebif 44, and it is working fabulously. Everyone reacts differently to medication, so what works for me may not have the same effect on someone else. What medication works for you? 2. Blood-work: Considering that the current MS treatments cause a lot of issues, it is crucial for patients to get blood-work done every four to six months, depending on your doctor. For example, Rebif can cause liver injuries so it is important to get blood-work done to ensure that your liver is working properly if you are taking Rebif. My doctor advises me to get blood-work done every six months if things are in order in the lab results. If, for example, my B12 level is low I begin taking the proper treatment to increase it, and my blood is tested again four months later. How often do you get blood-work? 3. MRIs: Due to that fact that MS causes lesions on the brain, MS patients are suggested to get MRIs once a year, unless there is an issue prior, to make sure no new lesions have formed, and the old lesions have either decreased or remained the same. 4. Exercise: It is important for all individuals to maintain a healthy lifestyle, but it is crucial for MS patients. I like to work-out three to four times a week, usually participating in an aerobic class or doing cardio on a machine at the gym. What’s your favorite physical activity that keeps you healthy? 5. Chocolate: Sometimes, a girl has to indulge herself, and my number one weakness is chocolate. If I’m just having “one of those days,” as MS patients often do, I like to relax and treat myself to a little chocolate. I do not discriminate; I love all kinds. What’s your weakness? Feel free to share with me the five things you can’t live without as an MS patient. Rebif is an injection that is used to treat relapsing forms of MS. Rebif has been known to decrease the number of flare-ups and slow the occurrence of some physical disability that is common in people with MS. The injection is administered three times weekly. Previously, Rebif has been given through a preassembled syringe where patients needed to learn how to load the syringe into an auto-injector called the Rebiiject II. The purpose of the injector is to make it easier for Rebif users to administer their injection by pushing a button located on the injector that inserts the medication underneath your skin. This month, Rebif produced the Rebidose, an already assembled, single-use autoinjector. This new injector makes it easier for MS patients to carry on-the-go due to the syringe already being in tact and ready for use. In the open-label user trial, 86 percent of the people who tried Rebif Rebidose said it was easy to use, and 87 percent said they would be comfortable using it away from home. Rebif Rebidose is also a medical product that is being recycled and reused as a new resource that is capable of powering homes and businesses. (Rebif Rebidose Sharps disposal program). To receive more information about the new Rebif Rebidose and the Rebif Rebidose Sharps disposal program, contact MS LifeLines at 1-877-447-3243. 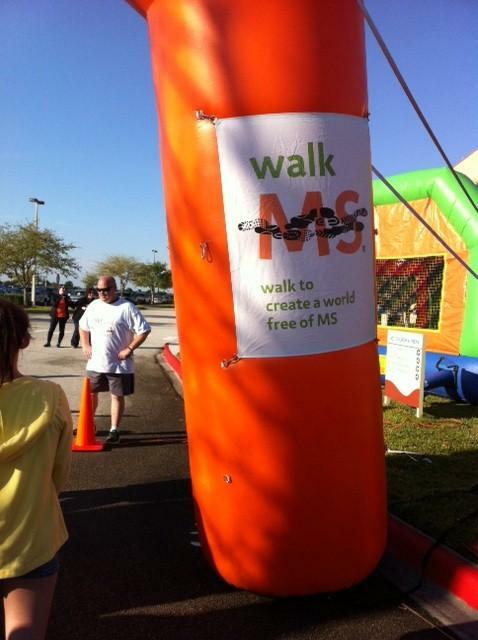 Considering that March is MS Awareness Month, it is no surprise that cities across the US decided to host their annual Walk MS 2013 this month. I attended Walk MS 2013 in m hometown of Melbourne last weekend on March 16. As a second-year walker, I was excited to continue the tradition with my friends and family. 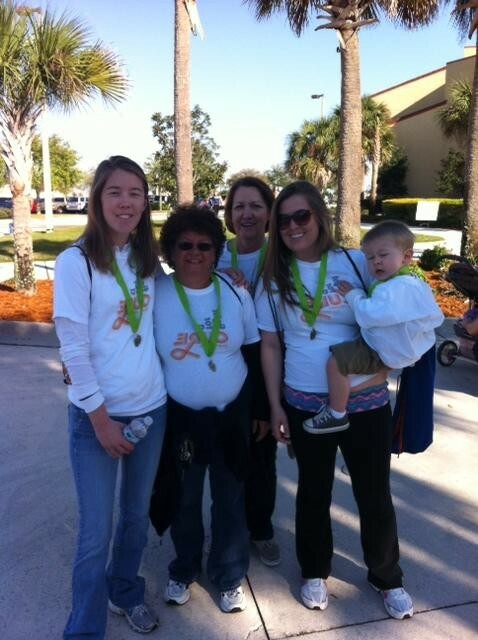 The walk took place in Viera, Fla., at the Church of Viera. I was pleased to see that the turnout this year was much larger than the previous. This year, my family and I prepared for the walk by designing matching shirts and donating funds at registration. Before the opening ceremony took place, vendors opened booths that offered free items to those who were participating in the walk. Winn-Dixie and Starbucks donated breakfast items and coffee and local hospitals came to hand out free water-bottles with their logos on them. A local woman that was in a wheelchair also set up a booth of her own. For a $5 donation, you could receive a key-chain that she hand-made with her favorite Winston Churchill quote, and on the back word MS in orange. Befo re the walk was over, I made sure that I purchased one of these key-chains. They were ordinary key-chains, but the older woman who made them was quite unique. She was diagnosed with MS in 2005, and she wanted to give back to the MS community by making her own item to sell in order to donate all of the proceeds to the National MS Society. As I walked the short route, which is 1 1/2 miles, I realized that I am lucky enough to have the support of and my family and friends that choose to walk with me each year. The love and care that they have given me regarding my illness throughout the years has made me stronger as an individual, and has made us stronger as a family. As long as there is no cure for MS, my family and I will continue to attend Walk MS each year in order to get closer to a cure. Medicinal treatments such as oral agents and infusions are benefiting multiple sclerosis patients. Multiple sclerosis is a nervous system disease that affects your brain and spinal cord. Some of the symptoms include weakness in the arms and legs, fatigue and blindness. Doctors, researchers and the Food and Drug Administration are currently discovering new advancements in treatment for MS.
Constance Easterling said that the new oral medication, Tecfidera, benefits MS survivors if they are frustrated with their injection medication. Easterling, a clinical coordinator for the MS Care Center of Neurological Services of Orlando, has focused on the study of multiple sclerosis since 1998. Tecfidera, a new oral pill for MS patients, is currently awaiting approval by the Food and Drug Administration. This oral treatment has shown in its trial that when taken twice daily it can decrease the chance of a relapse by 53 percent. The pending decision of Tecfidera will be decided on March 27. Leah Delorenzo, a 24-year-old graduate student at the University of Central Florida, was diagnosed with multiple sclerosis at 18 years old when a neurologist in Tampa said that she had optic neuritis, a common symptom of MS. Optic neuritis is an inflammation of the optic nerve that may cause sudden blindness. Delorenzo said that as a young student, she embraces what the newer generation drug that is the oral pill has brought to MS survivors. Delorenzo was previously on Rebif, which caused bruising and lumpiness to her injection sites, Delorenzo said. Delorenzo began taking an oral agent instead of the injection and realized that it was a much better fit for her. Delorenzo has been taking Gilenya, the very first FDA approved oral drug in MS history. “I really like the oral pills because I got sick of the injections,” Delorenzo said. MS researchers are also looking at more potent medications for earlier use in treating MS. In the current Strive study being conducted by Scott Silliman, MS patients are being given Tysbari at an early stage of their diagnosis. Silliman, an associate professor of neurology at UF Shands in Jacksonville, said that Tysabri is the strongest drug in the market for controlling MS. Tysabri is a monthly infusion that has to be given to patients in a lab. Because the drug is so aggressive, it is often considered to be used as a last resort treatment for MS patients who experience relapses frequently. Silliman’s purpose is to prove that the illness may not progress if it is treated with Tysabri when patients are first diagnosed. Although the study has only been in progress for about a year, Silliman has seen some very positive results in his volunteers. One patient was in the need of using a cane in order to get around due to paralysis in both of her legs. After a few infusions of Tysabri, she is now able to walk on her own without the assistance of her cane, Silliman said. 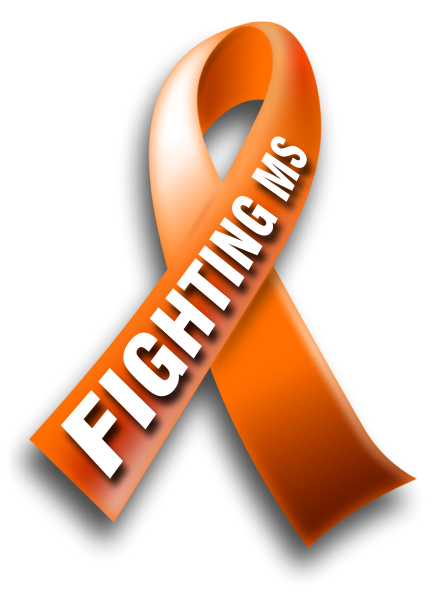 March is MS Awareness month and cities all over are hosting Walk MS 2013 to raise funds for a world-free of MS. This is my story, and I would love to hear yours! For this first blog post, I am going to tell my story about how I was first diagnosed with Multiple Sclerosis. I am going to make this short and sweet, considering this blog is not all about me, but about my viewers as well! That morning, walking was difficult. I lived in New York City in a small apartment that was smaller than my current walk-in closet. As I opened my eyes from a restless night of sleep, I realized that the previous two days had not been a nightmare; this was reality as its worst. After deciding that my life was too complicated to deal with on my own, I moved back to my hometown of Melbourne, Fla to live with my parents. Just as I was getting re-adjusted to the small town life, seven months later I woke up and realized my nightmare was happening again. My legs were weak and filled with a tingling sensation, and my arms felt as if they weighed two tons. As my mother drove me to the local neurologist, I knew he would not bring good news. Another MRI was done, and I waited with my mother in the doctor’s office for the results. I knew that if he diagnosed me with something, I would be relieved. I had remembered the previous events in New York, and I knew deep down that it would happen again. Relief was all I could trust. So, I got my wish. He said they found a new lesion on my brain, and that I had MS. As I heard the words, I was surprised when I wasn’t relieved. I actually wasn’t in the room at all, not mentally. I was in my ’95 Toyota Celica, cruising the town with my friends. I was laying on the beach in the sand, feeling the warm rays of the sun beat down on my skin. I was in my English class, listening to my poetic teacher read the beautiful words of Walt Whitman, wishing I could write like him. I was anywhere else, but I wasn’t there. Everyday life is a struggle, and the systems vary as each day passes. Sometimes I feel too weak to get out of bed, and sometimes I feel incredible, but I will never take a single day for granted. MS is just something that happened to me, it is not who I am, and although it makes up a large part of my life, I do not regret that it happened to me. All I can do is take my experience and touch others in my life by spreading MS awareness. I hope you all do the same, and remember that you are who you are because of what is inside, not because of life’s challenging obstacles. (From left to right) Photo from newstalkcleveland.com Subscribe to the MS Magazine – It’s free! I hope you view this post as a beacon of hope, and you walk away feeling satisfied, fulfilled and enlightened. Please share your story with me, and anything else that inspires you.